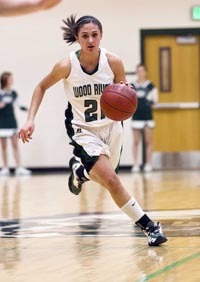 Two-time All-State girls’ basketball player Kaitana “KT” Martinez of Hailey’s Wood River High School got her first playing time for the Dartmouth College women’s basketball team prior to Christmas. Freshman point guard Martinez, sidelined from early-season action for New Hampshire’s Big Green while rehabilitating a knee injury, played four minutes Dec. 15 during a 64-57 Dartmouth loss to Florida International University at Miami’s U.S. Century Bank Arena. On Dec. 20 at Milwaukee, Wisc., Martinez played nine minutes and made a free throw plus pulled down a rebound and notched an assist during Dartmouth’s 70-52 loss to Marquette University at Al McGuire Center. The Big Green team (1-9) hits the hardwoods Saturday, Dec. 29, at home during the nation’s longest-running collegiate women’s basketball tournament—the 36th annual Blue Sky Classic. Dartmouth is set to play Duquesne at 7 p.m. Saturday.